2 Part Foam Insulation- How to Work with it in Colder Temperatures? When 2 Part Foam is sprayed onto your walls, floors and ceilings, the shell of your home becomes protected. It’s this protection that blocks heat gain in the summer and heat loss in the winter, thus preventing dramatic temperatures changes in the home. Correctly installed, insulation delivers comfort and lower energy bills during the hottest and coldest times of the year. 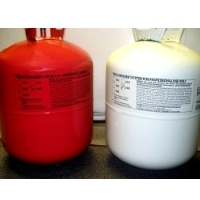 But working with it in the winter time is a little tricky since the core temperature should be above 70 F.
2 Part Foam Insulation comes in two tanks- A and B.Â The key to getting good yield and foam that actually sets up properly is an even stream between the â€œAâ€ and â€œBâ€ tanks. The way you get that is getting the foam up to temperature. The â€œAâ€ chemical has the consistency of milk, the â€œBâ€ chemical has the consistency of molasses. Warming up the â€œBâ€ chemical thins it out considerably, so it can flow at the same rate as the â€œAâ€ chemical. Once it gets up to temperature, it will take quite a while for it to cool. But itâ€™s critically important to get the foam up to temperature before you begin use. Keeping it in the warmest room in the house and using an electric blanket is usually your best bet. One tip is to build a little â€œhot boxâ€ with rigid insulation, and drop a 40 watt incandescent light bulb between the tanks, and leave it overnight.